Tooth wear is caused by damage to the outer layer of the tooth called enamel. When enamel is worn away it exposes the dentine layer underneath which is made up of tubules connected to the nerve of the pulp. Patients suffering from tooth wear may experience symptoms such as sensitivity to cold and hot drinks and air. The dentine layer of the tooth is much softer than the enamel, and wears away at a more rapid rate than enamel. There are various reasons for teeth to become worn. An obvious sign you are grinding your teeth is the appearance of flat, level teeth that appear slightly hollowed and darker in the centre. Strong acids constantly and frequently in contact with teeth may also cause teeth to erode and wear away. Acids effecting tooth surface loss maybe from citrus fruits, fruit juices and/or fizzy drinks. People suffering from eating disorders or gastric regurgitation may also exhibit erosion to their teeth. Simply brushing too hard or using a hard toothbrush can cause significant wear to your teeth as well as gingival recession. Many people unintentionally brush their teeth too hard in an attempt to make them sparkly clean when in fact; only slight pressure is required to clean your teeth effectively if the correct technique is being used. What can I do about my tooth wear (tooth surface loss)? There are various ways to prevent, stop and resolve tooth wear. The following are ways of dealing with the causes of tooth wear described above. The advantage of this is no treatment and associated costs, but the disadvantage is the tooth wear may become worse, decreasing the prognosis of the eventual tooth restoration (as tooth structure is now poorer). A splint is something that covers the biting surface of your teeth. 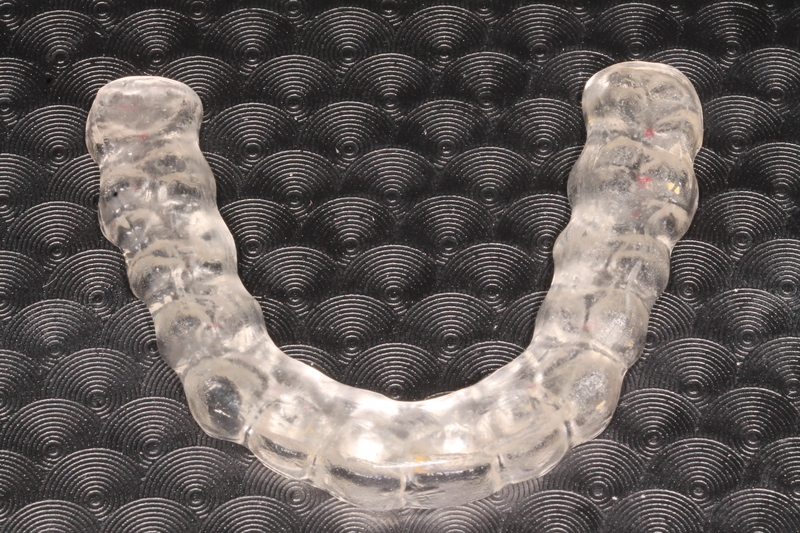 It is made from hard acrylic that is customised to fit your teeth. The splint works by protecting your teeth when grinding, so you wear down the acrylic instead of your own teeth. It is an effective and quick solution but people who heavily grind their teeth may require replacements. Splints may also help resolve any temporomandibular joint pain or discomfort. 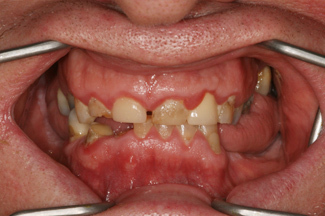 An example of a Michigan’s splint provided in London, occlusally balanced to provide smooth excursive movements, reducing stresses on teeth and the temporo-mandibular joint (TMJ). 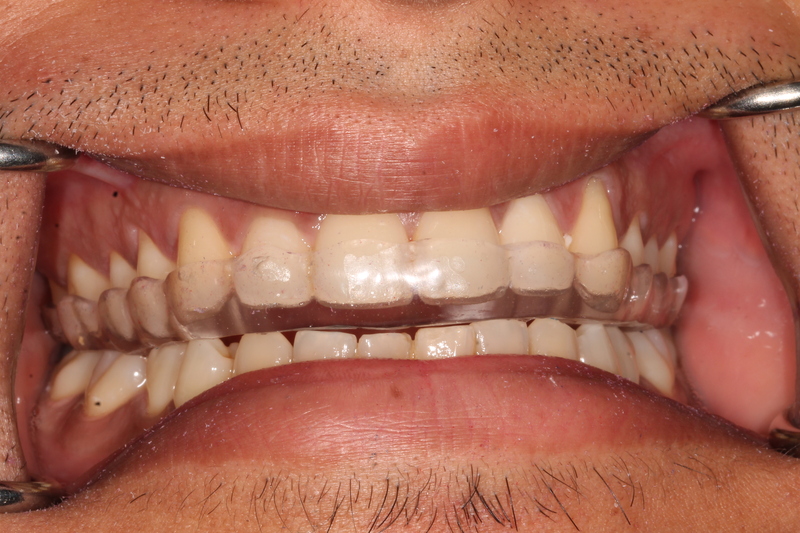 Tooth wear causes teeth to look flat, short and discoloured, and not aesthetically pleasing. 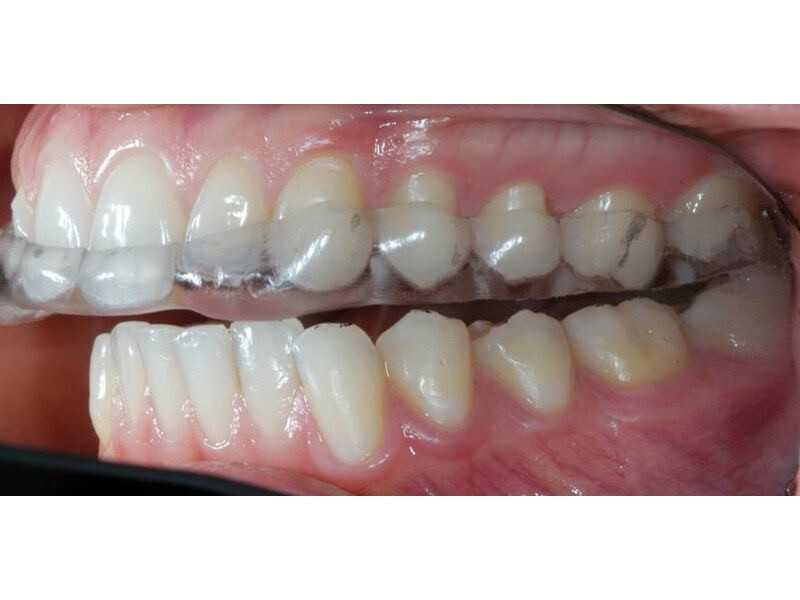 Worn down teeth can be built up using composite white filling material, or the placement of crowns or veneers. Specific shades of these restorations are individually selected to match the rest of your teeth, and shaped according to the golden proportion. The best material is used to obtain a natural result, and will give you a beautiful smile. Crowns can also be used to cover and protect a heavily restored tooth from breaking apart. There are various materials with different strengths and characteristics. Your dentist will discuss which one is right for you. When moving our lower jaw from side to side, normally the canines are incontact, and cause the other teeth to separate and thereby protecting the remaining teeth. Canines have long roots and are designed to handle these excursive movements. Wear and tear on the tips of the canines, often from tooth grinding (called bruxism) allows the top and bottom back teeth to come into contact. This is called “group function”. Group function may lead to fracture of posterior teeth in which have large restorations with thin enamel walls. To treat this, your dentist may recommend building the canines back up with white composite fillings to regain “canine guidance.” The teeth will initially feel strange as you have been taken back to how the teeth used to be. 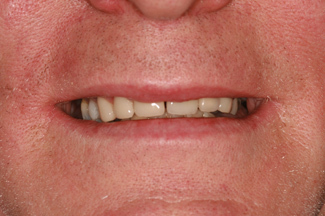 The overall effect will be to protect your remaining teeth again and decrease splitting forces on the posterior teeth. Grinding and eating disorders may be caused by stress and depression. Without finding and resolving the causes of stress, it becomes very difficult to stop tooth surface loss. Possible solutions are to talk to a friend, family member or medical practitioner, meditation, delving in to a hobby that makes you feel happy, taking time off work for travel, or visiting a beauty salon/fashion store and building up self-esteem. Each person is different and so some solutions are suited to one more than another. Stress is an ever increasing problem amongst people in this day and age, but there are many things out there that make life more pleasurable. Many people cause damage to their teeth by simply using the wrong type of brush and technique when brushing. A hard brush will cause trauma to the tooth enamel and gums resulting in tooth wear and recession. Symptoms include hypersensitivity to cold and poor tooth appearance, with cavitation at the tooth-gum interface. It is recommended you use a soft or medium toothbrush, applying a gentle pressure (imagine a force just enough to indent a ripe tomato). Certain electric toothbrushes are also beneficial as they torque out when you are brushing too hard. The correct technique of tooth brushing can be a little tricky to master at first, but practice makes perfect. Please find the correct technique of tooth brushing by clicking here. To find out more about any of these options and see which is best suited to your case, please book a consultation at one of our practises in North or Central London and get an assessment from our experienced dentists.